One of the principal neoimpressionist painters, Paul Signac, b. Nov. 11, 1863, d. Aug. 15, 1935, worked with Georges Seurat in creating pointillism (or divisionism). Signac published From Delacroix to Neo-Impressionism (1899), explaining their theories. Signac's prosperous shopkeeping family gave him financial independence. Unlike Seurat, he had virtually no formal training; he taught himself to paint by studying the works of Claude Monet and others. 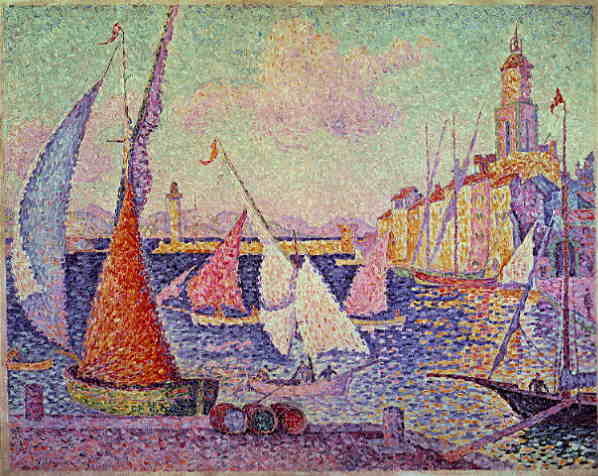 After he and Seurat met in 1884, they developed their technique of painting with dots--or "points" in French--of color, which led to the name pointillism. As Signac explained, they used the pure impressionist palette but applied it in dots that were to be blended by the viewer's eye. What Signac called "muddy mixtures" were to be banished from painting and replaced by luminous, intense colors. Many of Signac's works are landscapes, inspired by the bright sunlight of southern France. He also painted some figure compositions. The neoimpressionists influenced the next generation; Signac inspired Henri Matisse in particular. As president of the annual Salon des Independants (1908-34), Signac encouraged younger artists by exhibiting the controversial works of the Fauves and the Cubists.